I really appreciate receiving "Just For Canadian Doctors" and I find the content continues to be both educational and fascinating. In the most recent edition received this morning the article "A Passage to India" was indeed very interesting. Regrettably too few Canadian physicians seem to be willing to get involved with medical missions such as Dr.White describes. Over the past thirty years or so I have felt privileged to be able to contribute to nine such medical mission in Tunisia, St.Lucia and on the last four occasions in the interior of Peru. All of which were personally very rewarding and each made me realise how fortunate we are to have the Canadian healthcare system. Again my congratulations and thanks for your publication. I want to notify you of my change of address… I always have enjoyed the reading of your magazine. Thank you! Yes, this is in fact the article I had in mind. Thank you very much for finding it and sending it to me. Your magazine is very much enjoyed in our home. Thank you. Topical articles, nice to read as a relief from the medical literature we have. Useful for travel ideas. I read your column (Doctor on a Soapbox) every issue and all of your articles for me have been spot on. Keep on writing. Thank you very much! Yes I LOVE this magazine.. I keep all to re-read 🙂 My family also reads it! Keep up the great work. Your journal is interesting and the articles are informative. I enjoy the format and variety of your magazine as is. I have no suggestions for improvement. I think that your publication is just fine. It fits in the middle, between the Provincial & Federal publications. Family adventure is always exciting for all ages. Enjoy reading the magazine. 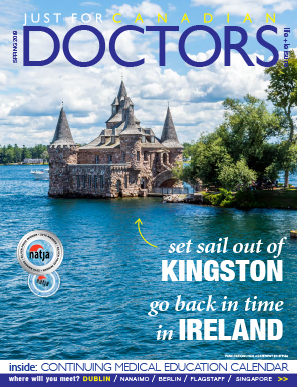 Just For Canadian Doctors is an excellent magazine. After seeing your article and the conference available (Prague) I immediately phoned home and told my wife. She said let’s go. I quite enjoyed the mix of light reading, travel and tax information. Well done! We have enough hard medical reading available. A good niche product. 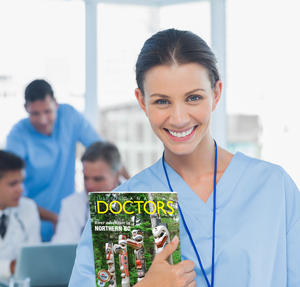 I’ve just read with great interest your most recent edition of Just For Canadian Doctors magazine. You captured the essence of hanging out in Maui. I enjoy doing Sudoko for a bit of relaxation and send them in not expecting to win. Thanks for the article this summer about the Woodward Dream Cruise. Thanks for sharing your experience. Love the various columns! Keep up the great offerings! Thank you for the wonderful photography - it brings the articles to life. Good publication, give MD a glance of all the CME available around the world. I enjoy it all!! Keep up the good work! I enjoy reading your publication. By the way, we are actually travelling and touring B.C. this summer for our vacation! Please congratulate Dr. Kelly Silverthorn on a very entertaining article. It makes a lot of us laugh at ourselves as it hits too close to home! Great read keep them coming! I was having lunch in the clinic’s kitchen and as there was no one around to talk to in desperation I picked up the only magazine on the table which happened to be Just For Canadian Doctors. I thought I could brighten up my day by visualizing myself on the beaches of Maui. I am a little slow getting around to reading your lovely magazine due to heavy volume of literature that falls through my mailbox…I really appreciate when a magazine features a truly creative, tasty and easy to follow vegetarian recipe as did your magazine in the Nov/Dec issue. Thank you and keep up the good work. The beautiful tour through France by canal was also a real treat. I want to thank you for your help. I did get some contact as a result of your publication. I have always found your CME calendar very useful, but I've noticed for the last several issues that you no longer list any conferences for obstetrics and gynecology. I'm hoping you'll bring it back! I like your magazine especially the CME calendar.